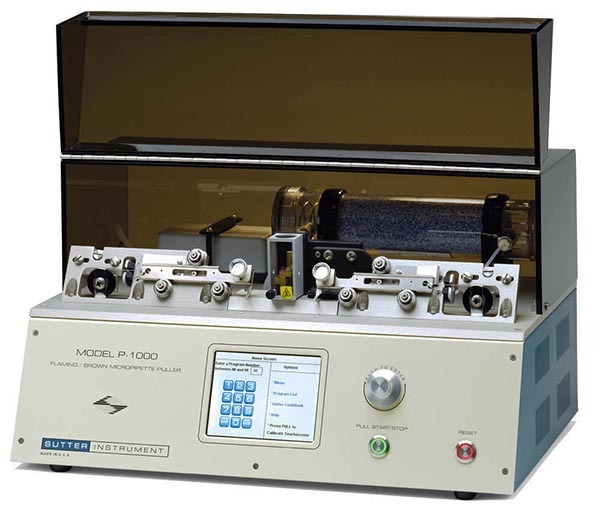 Developed through years of experience with the Flaming/Brown style micropipette pullers and infused with leading edge technology, Sutter is proud to introduce the P-1000 micropipette puller. The most obvious new feature is the color touchscreen display that provides an intuitive and full-featured interface. The extensive library of programs found in the popular Sutter Cookbook has been incorporated into the P-1000 puller and is available to the user via the touchscreen display. You need only specify the glass, filament, and type of pipette you require and a suitable program will be identified and available for installation. This takes the guesswork out of pipette pulling and simplifies programming. New features for the P-1000 include: diagnostic testing of all puller components, built-in error detection of air pressure loss or filament burnout, easy access to ramp test, measurement of jaw temperature, and access to previous pull results with the heat on times for each cycle of the program. In addition, help topics are pre-loaded to assist with on-site troubleshooting and the built-in glossary includes text, pictures, and diagrams explaining the terms used in micropipette fabrication. A rotary dial is offered as an alternative to the keypad for numerical entry.